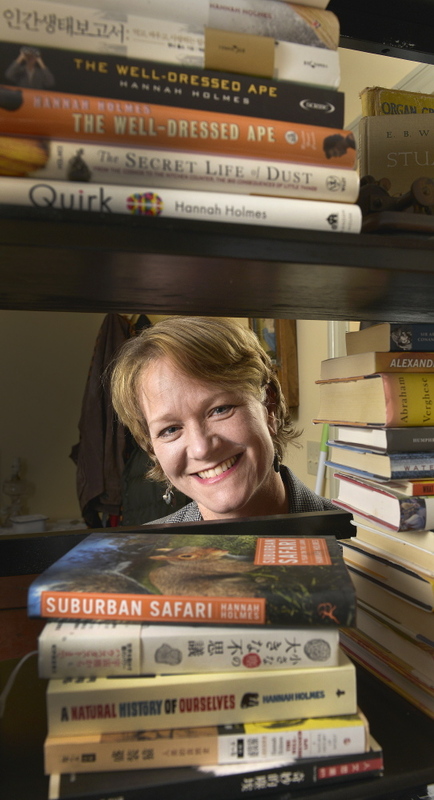 South Portland resident Hannah Holmes has published four nonfiction, science-oriented books including “Quirk: Brain Science Makes Sense of Your Peculiar Personality,” “The Well-Dressed Ape: A Natural History of Myself” and “Suburban Safari,” which examined the inhabitants of her backyard (spiders, chipmunks and crows included). But the publication of “Quirk” corresponded with a general crash in the publishing industry, and Holmes now mostly makes her living selling real estate. We talked to the Maine native (her mother was one of the ’60s era back-to-the-landers) about carbon footprints, the locavore movement and sustainability, including the sustainability (or not) of the 21st-century writer’s life. LAST WORDS? With all this passion for the planet, is Holmes really done with writing? When she quit, she said, “I was never going to type another word again.” But that feeling is starting to pass. She just wrote a piece for “O” magazine. And she just taped a TEDxDirigo talk.